When I went from Light Infantry to M113 APC mounted Mechanized Infantry, one big cultural shift I wasn’t prepared for was the obsessive attention paid to mechanical maintenance on the company vehicles. An H-series TO&E M113 equipped Infantry company had three platoons of four M113s, plus an M113 for the Company Commander, and one for the Company XO. It also had a Humvee for the CO, and one for the company 1SG. The company also had two M35 series 2-1/2 ton trucks, one with a 3/4 ton trailer, and one with a 400 gallon water trailer. And every Monday morning, the vast majority of the company would head to the motor pool, and spend the day performing maintenance on the vehicles. For instance, I was in the 1st Squad, 1st Platoon, and my squad “owned” the M113 marked with the bumper number A-11. The assigned driver and I (I was the track commander) would whip out the operators technical manual (commonly called the ‘Dash 10’ from the alphanumeric TM number assigned) and visit the chapters on daily and weekly Preventative Maintenance Checks and Services, or PMCS. All deficiencies found (and there were always deficiencies) were carefully annotated on DA Form 2404. Much like caring for your family car, a great deal of the work is done by the operator. But sometimes, there are issues that you need to take it to the shop for repairs. For instance, if the automatic transmission is slipping, you probably would let your mechanic work on that. You’ll notice in the brief discussion on the organization of the company, no mechanics were mentioned. That’s because the maintenance platoon belongs to the battalion Headquarters and Headquarters Company. The maintenance platoon provided organizational level maintenance to all the tracked and wheeled vehicles in the entire battalion, about 130 pieces of rolling stock. Further, the maintenance platoon tasked a Maintenance Contact Team of five or six mechanics, typically under a Staff Sergeant, to habitually support each company. So, while our mechanics were always in another company, they were also always our mechanics. Our mechanics were also the folks in charge of ordering parts as required for the vehicles. For instance, if I needed to replace a headlight on my M113, I’d write up the deficiency on the 2404, take it to the mechanics, and have them issue me one. The issue, from stocks on hand, also generated an order to the Division Main Support Battalion to requisition another part, to replace the stock. When deployed to the field, the Contact Team collocated with the supported company. 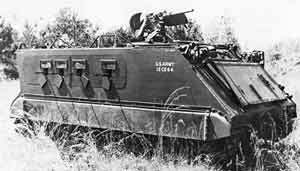 The team had an M113 APC, an M578 Light Recovery Vehicle or VTR, and an M35 series duece and a half, which had a plywood shelter on the back, and was used to carry the spare parts, known as the PLL or Primary Load List. The PLL truck was usually located at the field trains, with the battalion kitchens and other logistics were, leaving just the M113 and the VTR forward with the company. The VTR was fine for virtually all maintenance and recovery chores for the M113. The problem was, Mechanized Infantry companies typically swapped out a platoon of infantry for a platoon of tanks. The VTR was far to small to tow a tank. And the arrival of the M2/M3 Bradley exacerbated matters. The VTR was also underpowered to tow a Bradley. And so, with the introduction of the Bradley, the VTR was set out to pasture, and Mechanized Infantry battalions were issued the recovery vehicle Armor battalions had long been using, the M88. The M88 had been introduced to support (and built on the chassis of) the old M48 and M60 Patton series of tanks. It had only the thinnest margin of performance to support the much heavier M1 tanks, and later M1A1 and M1A2 tanks were just too heavy for it. And so, the Army procured the upgraded M88A2 Hercules variant for its Armor battalions. And indeed, the Army has decided that all heavy battalions will be equipped with the M88A2. The mechanics don’t exactly have the most glamorous job in the Army. Virtually every wrenchbender I knew was always covered in grease and grime. But they also, as a general rule, took great pride in the work they did, and put in long hours in the field repairing the vehicles that careless grunts had managed to break. I did learn to embrace the Army’s obsession with maintenance. It costs a lot of time and money to keep a vehicle well maintained. But it also means that the Army can routinely expect its vehicles to last a quarter century or more, even when subjected to some of the harshest treatment possible. A platoon of Bradley’s from 2-12 Cav conduct a TOW missile live fire at Graf in Germany. That’s a heck of a lot of missiles. Back in my day, you’d be lucky to be allocated one missile, maybe two, for an entire platoon. You’ll notice a small pop just before launch. When the gunner squeezes the trigger, that sends power to the missile, spins up the missile gyros, and activates the thermal battery to provide internal power to the missile. It’s also pretty cool to see the guidance wires strung out, and the automatic wire cutting function. The impact fuze not only detonates the warhead, but it also sends the wire cut signal back to the launcher. 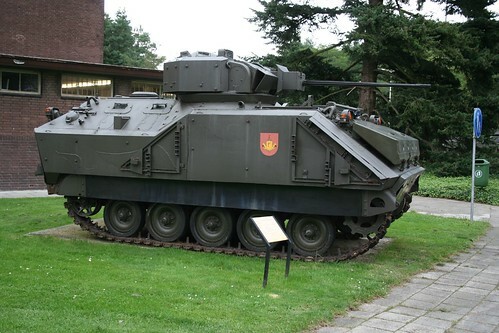 The M113 entered service as the primary Armored Personnel Carrier for mechanized infantry formations around 1960. It also quickly became clear that its fundamentally sound design would be useful for many, many other roles, either in specialized variants or just for general usage. For instance, there are ambulance variants, and command post variants. The M113 was replaced as the prime carrier of the mechanized infantry by the M2 Bradley beginning in the early 1980s, but the M113 still soldiers on in these support roles. In fact, in the Armored Brigade Combat Team of today, there are more M113 variants in use than there are tanks or Bradleys. But even though the upgrade of the fleet to the current M113A3 standard greatly improved the mobility of the carrier, it is rapidly becoming clear that the power, speed, cross country mobility, and ability to support command and control systems has reached the practical limit. It is time for a replacement vehicle. The Army sees a need for roughly 3000 new vehicles. They want a new general purpose carrier, a mortar carrier, an ambulance, a command post, and a couple other versions. What the Army doesn’t want is a clean sheet design, leading to a long, drawn out development program. The Army’s Future Combat System and Ground Combat Vehicle programs were disasters, costing billions of dollars in development, but not leading to any actual production contracts. In fact, the Army knows exactly what it wants. It wants the basic hull and machinery of the Bradley, minus the turret. A simple armored box, into which the appropriate mission equipment can be mounted. This stuff isn’t rocket science. 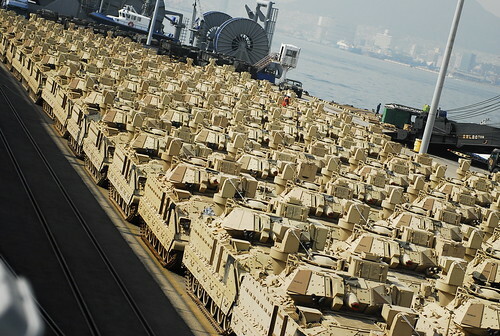 In fact BAE Systems, the maker of the Bradley, has been trying to sell the Army various Bradley derivatives for years. And the basic Bradley chassis is quite sound, also serving as the basis for the M270 Multiple Launch Rocket System. Further, Bradley suspension and powertrain components were used to upgrade the AAV-7A1 Amtrac fleet, and are upgrading the M109A6 Paladin Integrated Product improved self propelled 155mm howitzer. Sharing that basic platform eases the supply and logistics train. Of course, the DoD acquisition system is a nightmare. The Army can’t just pick up the phone and order what they want from BAE. They instead have to go through the internal acquisition process justifying the need for an M113 replacement, which takes time, manpower and money to realize something that everyone already knows. Then comes the fact that, when you start talking about spending a couple billion dollars, you have to take bids for contracts. So the Army published a Request For Proposals, or RFP. And in spite of very narrowly tailoring the RFP to pretty much say “we want to buy turretless Bradleys from BAE” the Army still ran into some trouble. General Dynamics, makers of the Stryker family of vehicles, protested to the Army that the RFP unfairly excluded Stryker variants from the competition. And they do have at least some point. At least one heavy BCT deployed to Iraq with Stryker ambulances in place of its M113 ambulances. But while a Stryker ambulance might have been suitable for Iraq, the Army can very easily see scenarios where such an ambulance would not be able to keep pace with tanks and Bradleys. That’s the whole point why it wants turretless Bradley vehicles. General Dynamics has recently decided it won’t tie up the issue with a protest to the GAO (which would tie the program in knots for years). Instead, it will likely lean on friendly representatives in Congress to at least give them some small slice of the pie in future budgets. After all, the Army may want turretless Bradleys, but it can only buy what Congress tells it to. Here’s the original “industry day” flyer on what the AMPV objectives were. Is the Bradley due for upgunning? Developed in the 1960s and 1970s, and entering service in the 1980s, the M2/M3 Bradley series of fighting vehicles was designed to counter first generation Soviet BMP and BTR series vehicles. As such, the Army equipped it with the 25mm M242 Bushmaster chain gun. The M242 performed very well against Russian and Chinese built armored vehicles in Desert Storm, and later in the 2003 invasion of Iraq. But the threat is not static. More and more, infantry carriers and other armored vehicles are getting bigger and bigger, and carrying more and more armor. And small anti-tank missile teams are employing longer ranged missiles. The armor piercing ammunition for the M242 has been improved, but there is little room for growth. To achieve more armor penetration, the Bradley will simply need a larger gun. And to that end, the Army is experimenting with a 30mm autocannon. The 30mm Mk44 Bushmaster II gun isn’t new. It’s been around in various forms for almost as long as its little 25mm brother. It was intended to be the main armament of the cancelled Marine Corps Expeditionary Fighting Vehicle. And it is mounted as secondary armament on the Navy’s LCS and LPD-17 ships. Various foreign powers have evaluated or adopted it. So adapting it to the Bradley would seem to be a simple matter. The Bradley was designed with the smaller 25mm in mind. The size of the gun here wasn’t so important. The gun and its mount are in the gunhouse portion of the turret, above the hull of the vehicle proper. The size of the gunhouse itself wasn’t critical. But the ammunition cans for the gun are stored inside the turret basket. That’s the part of the turret, the ammo system, turret drives, and support that extends down inside the vehicle, and rotates on a roller path on the bottom of the hull. And the turret basket size, essentially its diameter, went far to fixing the exact size of the Bradley. You can simply put a new turret on the Bradley, with the same size turret basket. The 30mm round isn’t that much larger than the 25mm. 25mm ammo is 13.7 centimeters long. The Bushmaster II 30mm ammo is 17.3cm long. But that extra inch or so of length cuts into the crew space of the Bradley. Already fairly cramped when designed, the turret crew space has further been crowded by installation of additional electronics, fire control, and networking equipment. An inch doesn’t seem much, but even my relatively small 5’10” frame, when seated in the commanders seat, had my knees in uncomfortable contact with the ammunition cans. We’ll see if the Army decides to pay to upgrade the Bradley, search instead for a whole new vehicle, or just continue to move along with what we have and hope for the best. Author XBradTC2Posted on September 29, 2014 Categories armor, army, ARMY TRAINING, weaponsTags ARMY TRAINING, Bradley Fighting Vehicle, guns, weapons13 Comments on Is the Bradley due for upgunning? The Bradley Engineer Squad Vehicle (ESV) is a mobile and survivable combat platform that enables the engineer assets in the Brigade Combat Team (BCT) to maintain the momentum of the fighting force while conducting required offensive, defensive, area presence and unique engineer/sapper operations. The speed, armor and firepower of the Bradley ESV enhances its survivability while enabling combat engineers to effectively execute their assured mobility, countermobility and urban combat mission requirements when and where required. an assortment of various sapper tools and devices. Additionally, ESV has the growth capability to accommodate and control future MEPs (to include robotic/autonomous mine and/or IED detection/neutralization systems, and mobile mine dispensing systems) as they become available. ESV will be the same Bradley variant (A3 or A2 ODS) as the BCT it supports to maximize commonality of the platform while reducing the maintenance footprint and required logistics support. Further, the Army has recently opened up positions in Brigade Engineer Battalions to women. One of the first is MAJ Chrissy Cook, S-3 of the 3rd Brigade Engineer Battalion. Maj. Chrissy Cook made history in the 1st Cavalry Division two weeks ago when she led her Bradley crew to “Top Gun” status during gunnery, the first female Bradley commander to do so. Cook, an engineer officer and S-3 for 3rd Brigade Engineer Battalion, 3rd Brigade Combat Team, 1st Cavalry Division, led her crew to a top score of 835 with nine of 10 engagements passed to seal “Top Gun” status June 17, as well as a page in the history books as the Army continues to open doors to female service members for service in direct combat roles. As an engineer, Cook’s branch has long been open to males and females. I guess they’ve changed the Tables a bit, because back in the Stone Age when I was a BC, 835 was certainly nothing to crow about. Can I take one home? Just one? local television and print media at Pier 8, Pusan, Oct. 12. The U.S. Army Prepositioned Stock IV is receiving upgraded Bradley Fighting Vehicles as an ongoing effort to strengthen readiness across the peninsula. Author XBradTC2Posted on October 19, 2011 Categories armyTags Bradley Fighting Vehicle, Pusan, South Korea2 Comments on Can I take one home? Just one? Armies do not develop weapon systems in a vacuum, rather evolve them based upon assessments of the existing systems. After a decade or so of evolution, the US Army fielded the excellent M113 Armored Personnel Carriers (APC). Great vehicles for their time (and still useful today), but these were for all purposes “battlefield taxis.” From the infantryman’s perspective, this got him to the battlefield without getting the boots muddy but kept him from contributing to the battle until dismounting. At the time planners felt future battlefields would be polluted with nasty radiation and chemical agents. Thus sprang the idea of allowing the infantry to fight from the vehicle, to dismount on the objective. 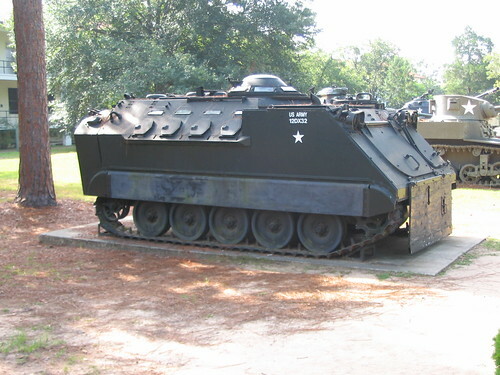 The Infantry School itself first dabbled with such a vehicle with a modified M113. With benches allowing back-to-back squad seating, the infantry used firing ports cut into the sides. Eventually the M113’s vendor, FMC Incorporated, offered a factory-built refinement along the same lines, which received the designation XM734. Although typically seen with the standard .50-cal M2, some XM734 tested 20mm cannons. In the mid-1960s, the Army opened the MICV-65 program and tested XM734s alongside an offering from the Pacific Car and Foundry, XM701. Pacific Car based the later on the chassis of their M107/110 series of heavy self-propelled guns. Like the FMC vehicle, Pacific Car gave their vehicle firing ports and options for a turret mounted .50-caliber or 20mm gun. In trials the XM701 emerged as the better vehicle. But after further testing, the Army rejected the type in 1966 as too heavy for transport in theater support cargo aircraft (at the time C-141s). But the MICV project was not a drive up a blind alley. The Army still wanted something. In 1968 a task force led by Major General George Casey (father of the current Army Chief of Staff) used the experience from the MICV project to define the attributes desired for an ICV. More importantly, the task force also laid the ground work for just how the Army would use any ICV. At the time, FMC offered a revised XM734. Although using the same base M113 chassis, the XM765 featured improvements to crew stations and fuel storage. The XM765 featured a commander’s turret with a 20mm cannon (although the one pictured above has a smaller turret with fittings for a .50-caliber mounting). On each a revised and sloped side bristled with four firing ports. Two additional ports on the loading ramp covered the rear of the vehicle. The ports allowed infantry to use their M16 rifles (and often cited are the M3A1 grease gun SMGs, always one of my favorites!). Fuel tanks moved from the sides of the crew compartment to under the floor. The downside was the XM765’s use of the M113 powerpack. With all the extra weaponry, to keep decent performance figures FMC reduced the armor. For this and other reasons, the Army didn’t bite on the XM765 opting to continue pursuit of something better. But that did not prevent FMC from continuing development. In the early 1970s the company started offering an even more refined XM765 as the AIFV to foreign customers. The Netherlands ordered 880 AIFVs in 1975 as the YPR-765. The Dutch specified some revisions to crew arrangements, fewer firing ports, and used an aluminum-steel laminate. But the AIFV retained the M113A1 power train. In the turret, the Dutch variant mounted a Oerlikon Contraves 25 mm KBA-B02 cannon. So when General DePuy said “…the Dutch are ahead of us…” this is what he had on his mind. Sort of ironic, you think? The AIFV became a cheap alternative to the Bradley, Marder, or Warrior IFVs. Twelve other countries, including Belgium, Egypt, Turkey, and Philippines also purchased quantities of the AIFV. Variants include TOW missile carriers and specialized C2 vehicles. The Dutch continue to use the YPR-765 today, even sending some to Afghanistan. Recent improvement programs removed the turret but improved armor arrangements, and is designated the YPR-765A1. The Egyptians opted to upgrade their 1,200 AIFVs to a new Egyptian Infantry Fighting Vehicle (EIFV) standard with a “Bradley” turret including a 25mm Bushmaster gun and TOW launcher. And with all that talk, you want to see some boom-boom! Well here is the boom-boom! A Dutch YPR-765 in Afghanistan. See why I say “sister” of the Bradley? And, for the record, the Dutch beat the US again – getting armor into Afghanistan!